Kyuhyun. 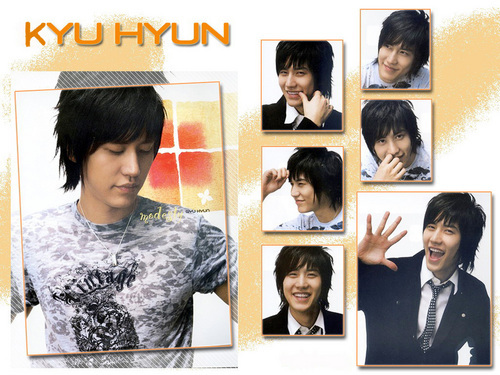 Charming Kyuhyun.... HD Wallpaper and background images in the Super Junior club tagged: suju super junior kyuhyun. This Super Junior wallpaper contains портрет, выстрел в голову, близком расстоянии, макро, and крупным планом. There might also be медвежья, басби, кивер, медвежья шкура, автобус, шако, and медвежатник. heeyyy ... kyuhyun very cute ! i love him ! ALL THE SUPER JUNIOR MEMBERS HAVE A CUTE SMILE..BUT I REALLY LOVE LEE TEUK HYUNG SMILY...HOW CUTE!!! i really really like kyu..
wish i can go to suju's concert this april in manila..
you are funny and cute ...!!! i love you....i love you...i love you.. gosh!!! He's damn cute!! Love him most for his brain! i really like kyuhyun. he really captured my attention first than the other! 당신의 아주 아주 귀여운!!!! 나는 당신의 음성 haha를 사랑한다! 아주 좋은!!!!!! a za a za fighting! there so cute and mouth watering ..
keep sopporting SUPER JUNIOR !!! ..i really love suju..most specially kyu hyun and leeteuk..:-)..i love them very much..super,,go super junior!! i really love you kyuhyun and also han-geng..
your so cute and handsome!!! hey kyuhyun's mine..hahaha..i love you my dearest kyuhyun...4ever and ever.. THE MOST HANDSOME HUMAN ON EARTH!!!!!!!! saranghe kyuhyun.. hope to see you soon!!!!!!!!!!!!!!!!!!! love you full KYUHYUN ! you are the apple of my eye kyuhyun..!!!! i love you..!!! Kyuhyun your so Cutie...sweety smile... I love all the member of Super Junior you're all cute..& talented!!! Kyuhyun when i hear your voices my Heart Skip a Beat! Saranghaeyo SuJu! Kyuhyun Oppa, i love your greatest voice, i love the way you sing with feelings deep from your heart. I love all the lyrics of your single album. You're so Cute too... More power Oppa saranghaeyo!! u're soooo cute ... i love you ... hope to see you soon in Jordan!! i luv when kyuhyun smile..
Good luck for your dreams. kyuhyun is got the most beautiful voice and look in suju soooooooooooo beautiful!!!!!!!!!!!!!!! oppa kyuhyun I really admire your voice ..
kyu, i just a fan for u. i don't love u like the ather people who fan to u.